I might be a little late to try avocado on toast, but it was really yummy! Since I am not eating 100% Paleo anymore - still keeping it dairy and gluten free - I need to find balance. This morning I made avocado toast using Udi's Gluten Free Bread. I was kind of hesitant with the gluten free bread. The gluten free bread that I have tried before was awful. It had zero taste, and it was hard as a rock. Udi's makes a whole grain gluten free bread - and it was the best! If you're looking for a good gluten free bread, I really recommend Udi's! 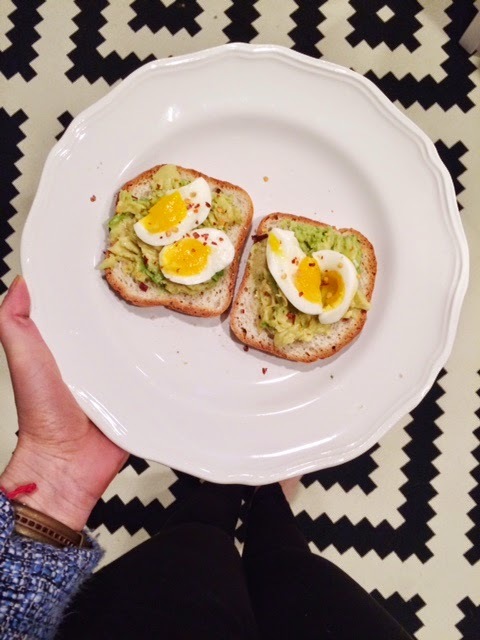 Spread the mashed avocado over the toast, place the sliced soft boiled egg over the mashed avocado, and sprinkle with red pepper flakes. Enjoy!